With just over one month of 2019 behind us, Realfiction has already been able to present several significant orders as well as attend and create excitement for Magic-as-a-Service at two important trade shows. The future of Mixed Reality is also starting to take shape as our Advanced Display Technology team continues to develop our groundbreaking Project Echo technology. Leading the Project Echo development is a new prominent member of our team Steen Iversen, and I hope you take the time to read the Q&A with him in this newsletter. Looking ahead, I can’t wait to see the rest of 2019 unfold, and I am excited to lead Realfiction during this groundbreaking period in our history. With a stronger team than ever, some truly mind-blowing technology in our labs, and a STEP-UP-2019 strategy to execute, we are shooting for the stars with some serious ammunition. An accelerated development plan for Project Echo, is a major part of Realfiction’s STEP-UP-2019 strategy. The person in charge of this endeavor is Steen Iversen, recently appointed as the company’s Director of Advanced Display Technology. In November, Realfiction launched the world’s first mixed reality media channel through long-term placement of the company’s Magic-as-a-Service (MaaS) concept inside hypermarkets and other major retailers. Realfiction’s Mixed Reality media channel enables promotion of products or brands through unique campaigns with a lot of flexibility to meet specific goals. The content can for example be changed dynamically during the day or week with over-the-air updates when needed. With the launch of the world’s first Mixed Reality media channel, Realfiction continues its transition from sale of hardware to sale of integrated MaaS, defined as the complete campaign, end-to-end: Mixed Reality content delivered dynamically and with interactivity options, the hardware display, the stand with commercial wrapping as well as establishment, maintenance and removal of the campaign in due time (the logistics and maintenance being handled by a partner). “We are excited to see that our MaaS concept is now delivered as the world’s first Mixed Reality media channel. I am confident that the effect of our displays will deliver great value for the different brand owners and suppliers in terms of increased attention and sales. This is very much in line with our strategy and a highly valued confirmation of the significant potential in our MaaS concept”, says Realfiction’s CEO Clas Dyrholm. Realfiction sees universal potential for its Mixed Reality media channel and expects the concept to generate 100 million DKK or more in annual revenue for the company within a few years. On November 27, Bilka was presented as the first hypermarket chain to install Realfiction’s Magic-as-a-Service (MaaS) concept as a Mixed Reality media channel. Bilka’s 19 hypermarkets will house up to 3 MR displays each, and has a total of 6-8 million visitors each month. The first three campaigns were presented in January 2019. Brands and suppliers can book unique campaigns on the media channel that last for 2 weeks or a month. The solution is very flexible with adjustable content and display placements based on current campaign purposes. On January 23, Realfiction announced the first three MaaS orders for retail campaigns utilizing the Mixed Reality channel at Bilka. The first two campaigns started on February 1stand are promoting selected FMCG products. The third campaign will commence by end February. The total order value for the three MaaS orders is approximately SEK 530.000. “With this new media channel, we are able to deliver in-store experiences that connect brands and consumers in a unique way. As the placements in the hypermarkets are already secured, you can essentially bring your campaign to the market much faster” says Clas Dyrholm. In December, Realfiction announced four separate Magic-as-a-Service (MaaS) orders for premium events in New York, Miami, Las Vegas and Toronto. With these orders, Realfiction and MaaS are gaining significant momentum in North America. The MaaS full-service concept for events, including everything from short term rental and installation of the hardware to original 3D content with interactive possibilities, is starting to gain international traction after a strong start in the Nordic region. The total order value of 588.000 SEK for these four orders indicate that there is substantial potential for Realfiction in the North American event market. “We consider these orders a significant international breakthrough for our MaaS concept, and specifically on the event and expo market in the USA. I am very proud of our hard-working sales team that has been able to quickly and successfully establish our MaaS concept in the USA,” says Realfiction’s CEO Clas Dyrholm. Two of the events, the ones in Miami and New York City, took place in December. In Miami, car manufacturer Lexus used a DeepFrame system to project a visual overlay when presenting their new LF-1 Limitless Future Concept Vehicle at the Design Miami event. In New York City, one DeepFrame system was used at the 20th S&P Platts Global Energy Awards Gala on Wall Street. Furthermore, in December, the company Kingspan, a manufacturer of sustainable building solutions, used a Dreamoc Diamond display again for a trade fair in Toronto. Lastly, a DeepFrame system was used in January at CES 2019 (the world’s largest consumer electronics event) in Las Vegas. The display was used by Panasonic to display automotive speaker solutions and configurations. To see a video of the installation shot in Panasonic’s booth during the CES show, simply click the image at the top of this story. On top of the previously mentioned MaaS retail campaign and MaaS Event orders, two separate hardware orders for 39 smaller Dreamoc displays were received in January. One hardware order covered 18 Dreamoc POP3 displays for a high-end manufacturer of garden products and the second order was for 21 Dreamoc HD3 Displays to Aestheia Imaging, a health care marketing company. “We have a very strong momentum right now, and each of these orders will attract more attention to our leading Mixed Reality solutions. In the MaaS space we are currently approaching international retail chains and brands to enable our scalable media channel platform to grow globally, and we look forward to sharing more information in the nearest future,” says Realfiction’s CEO Clas Dyrholm. The company attended Best of Expos in Dortmund, Germany and Integrated Systems Europe in Holland during Q1, both times showcasing its Magic-as-a-Service (MaaS) concept. The concept gained a lot of positive attention from attending companies and visitors in general. Next stop is Retail Expo in London, May 1-2, an important event for the retail marketing sector where Realfiction will continue to focus on showcasing its unique MaaS concept. 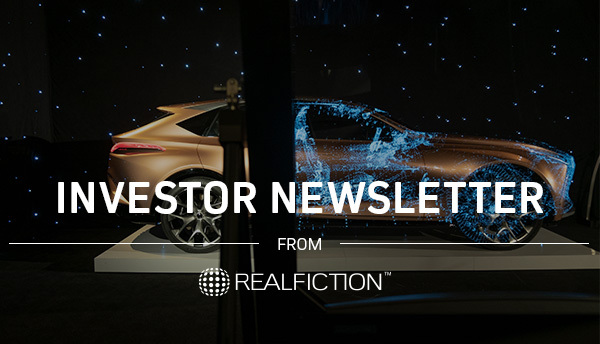 You are receiving this email because you have signed up to receive our investor related newsletter on our investor page.